A basic set lighting device for stage, studio and television. The 1KAF produces a soft edge beam which varies in diameter from 5.7 feet to 39 feet at a throw distance of 25 feet. The 1KAF is designed for operation with long life, high intensity, tungsten halogen lamps, with either medium bi-post or prefocus bases. 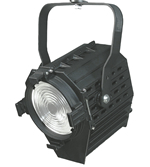 The luminaire is used in theatre for acting area lighting where beam shaping is not required, or in the studio as a key light or back light when a smooth even beam is required. Constructed of cast aluminum and designed to withstand trouping, the 1KAF is also used in nightclubs, museums and showrooms where high intensity, soft edged controlled lighting is required.